We spent a week in New York last month and naturally went armed with a list of foodie must-do places. Some of the places exceeded the hype and others were grave disappointments (suggesting we possibly place too much value on eating). More to come later from the boy, but here are my top finds from this trip. Part of the trip was spent exploring Brooklyn with our lovely friend Sarah, who’s been there all summer. We ordered a trio of meals to swap and share at Rosewater in Brooklyn – lamb burger, pancakes with peaches, pistachios and cardamom, and the best sandwich I’ve ever had. 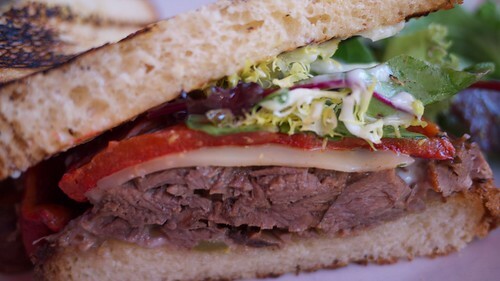 Lightly griddled bread, packed with layers of tender brisket, aioli-dressed salad and the ultimate punch came from slices of juicy marinated pepper. Even though the pancakes were great (and lord knows I’m a huge fan of the fluffy American breakfast treat) I was remarkably reticent about handing over the second half of the sandwich when the time came to trade. Rosewater does a great prix-fixe brunch – $14 including a drink. When is this magical institution of proper weekend leisurely lunching going to establish itself in London? After very disappointing cupcakes from- oh, just about everywhere we tried, I was starting to despair a little. And contemplating about ordering some Bittersweet Bakers or Ella’s Bakehouse goodies for our return (they’re my favourite London bakers by far) to make up. Then we made the pedestrian pilgrimage to Baked. Deep in Red Hook, it’s the artisan bakery established by Matt Lewis and Renato Poliafito. 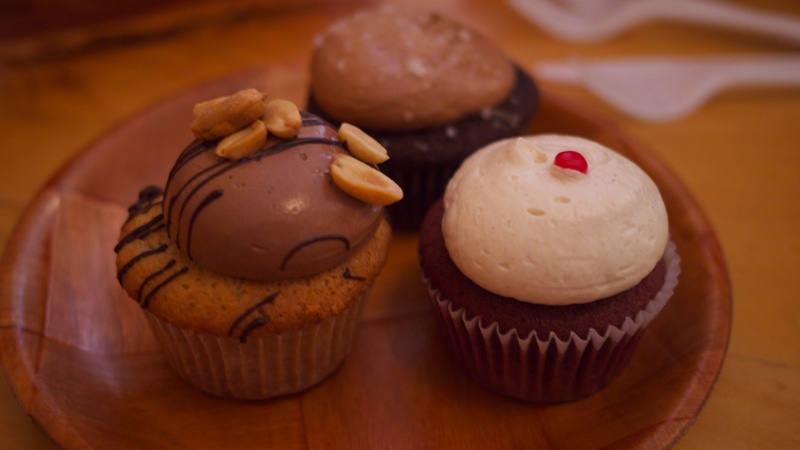 We shared three cupcakes: Peanut Butter, Red Hook Red Hot and their signature Sweet Salty, beloved by Martha. God, they were good. I’d have to say that the chocolate chip cookies and homemade marshmallows were even better. When I saw them serving the marshmallows in their hot chocolate, I even started to wonder if we could stay long enough til I could fit a cup in. Amazon just delivered both their books too. Will be thoroughly road-testing them soon. We stumbled across the Mac Bar and despite a planned trip to Lombardi’s later, we couldn’t resist it. We also couldn’t resist the regular size, $9.50, because… oh yes. Yes, it does. 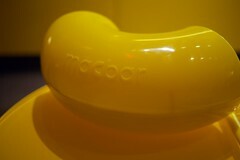 It comes in an undoubtedly environmentally unsound bright yellow plastic container in the shape of a macaroni elbow. The “Cheeseburger” option comes with ground beef, American cheese, and cheddar. The weather had shifted that day into squally showers and this was perfect comfort food. Yes. I am on a diet post-holiday. Thanks to lovely Sarah for schlepping us around, she’s an excellent tour guide. Pity the pics of the marshmallow and chocolate chip cookie didn’t come out so well. Or perhaps I’m just trying to deny to myself that we – ok, I – also motored through those. Come home soon lady! Let’s play at being tourists in London! That sandwich looks amazing. Bring on 13 November (when my plane touches down in New York)! So lovely to see you last night and meet the fellow – if you get the opportunity to brunch at Rosewater I heartily recommend it! Ohh I’m going to NY tomorrow for the weekend, I will check out these places! Rosewater sounds amazing indeed! 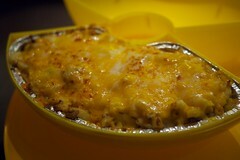 That mac place looks insane – for some reason I am jons-ing for mac n cheese today!